Thuật ngữ Sprint Planning Meeting trong Scrum là gì? /PMI-ACP /Scrum /Thuật ngữ Sprint Planning Meeting trong Scrum là gì? Each Sprint and each Sprint Planning Meeting starts with a WHAT-Meeting. Goal of this session is to define a realistic Sprint Backlog containing all items that could be fully implemented until the end of the Sprint. The Scrum Product Owner defines the Sprint Goal. Based on this goal the relevant entries in the Scrum Product Backlog are chosen by the Scrum Product Owner. These entries are updated and broken into smaller stories so that they can be completed within one Sprint. The entries are estimated & prioritized. The team defines their capacity for the upcoming Sprint. The Scrum Product Owner defines the Sprint Goal. It is a short description of what the sprint will attempt to achieve and what should be realistic and comprehensible for everyone. 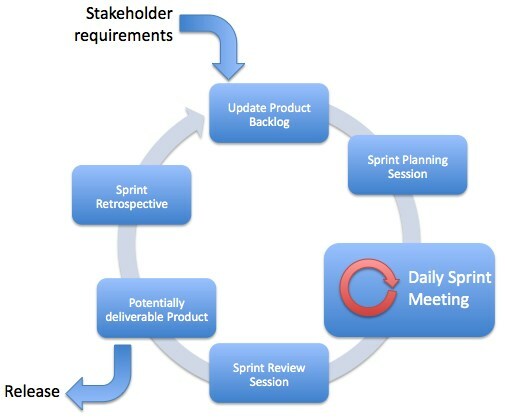 The total capacity of the Scrum Team might change from Sprint to Sprint. In order to come to realistic commitments it is necessary to know the total capacity of the team for the upcoming Sprint considering e.g. vacations, public holidays, efforts for Scrum Meetings and time needed for other activities during the Sprint. During the session the Scrum Product Owner presents the Sprint Goal and discusses it with the team. After that the Scrum Team iterates through the relevant items in the Scrum Product Backlog and the team commits to the entries which they think can be fully completed within the Sprint. The decision should be based on available capacity and knowledge about the entries. At the end of the session the list of all committed entries from the Scrum Product Backlog provides the base for the HOW-Meeting and the Scrum Backlog. The goal of the How-Meeting is to fill the Sprint Backlog by identifying the concrete tasks needed for complete implementation of the Scrum Product Backlog entries. Tasks normally include design-, implementation-, test- and documentation-activities. The HOW-Meeting can be done in a separate session after the WHAT-Meeting, during the WHAT-Meeting when committing the entries or both. After identifying the necessary activities they are estimated by the team. Base for this estimation should be person-hours. The team should how long it will need to do everything that is required to finish this activity.